GRIDLEY, RICHARD, army officer, military engineer, and entrepreneur; b. 3 Jan. 1710/11 in Boston, Massachusetts, son of Richard and Rebecca Gridley; m. 25 Feb. 1730/31 Hannah Deming in Boston, and they had nine children; m. secondly 21 Oct. 1751 Sarah Blake in Boston; d. 21 June 1796 in Stoughton, Mass. Richard Gridley became an apprentice to a Boston merchant at an early age, but by the 1740s he apparently was a “scholar” of John Henry Bastide*, a British engineer engaged in improving colonial defences. 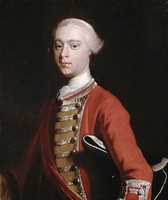 His study of military engineering may have led to his being chosen lieutenant-colonel in command of the artillery in William Pepperrell*’s expedition against L, ouisbourg, Île Royale (Cape Breton Island) in 1745. During the siege Gridley had “direction of the Batteries,” in particular the one at Pointe à la Croix (Lighthouse Point), and he also undertook some minor engineering tasks. Praised by Governor William Shirley of Massachusetts for his work, Gridley was rewarded with a captain’s commission in Shirley’s American Provincials (67th Foot), which garrisoned Louisbourg from 1746 to 1749. Placed on half pay at the disbanding of his regiment in 1749, Gridley saw no military service until 1755, when he was appointed colonel of a Massachusetts regiment in William Johnson’s expedition against Fort Saint-Frédéric (near Crown Point, N.Y.). Gridley commanded the garrison at Fort Edward and built fortifications at various points around Lake George (Lac Saint-Sacrement), earning Johnson’s praise that “if all the Officers of his Rank in the Army were equal to him I should have thought myself verry happy in my Station.” The following year Gridley became colonel, artillery commander„and chief engineer in John Winslow’s force of provincials. During the acrimonious debate between Winslow and Lord Loudoun, the commander-in-chief, over a proposed amalgamation of the regular and provincial forces, Gridley supported his commander to such an extent that Loudoun believed him to be the real leader of the provincial officers opposed to amalgamation. In 1758, as a volunteer under Amherst, Gridley again served at Louisbourg. He was consulted by the British general and also took command of some American carpenters after the death of their commander. The following year he raised a similar unit for James Wolfe*’s expedition and was allegedly present at the battle of the Plains of Abraham. 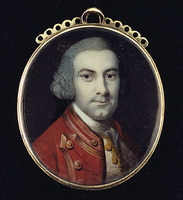 With the end of the war in North America, Gridley returned to civilian pursuits, and in 1760 he petitioned Amherst for a grant of the Îles de la Madeleine in the Gulf of St Lawrence in order to carry on a seal and walrus fishery. Although Amherst could only give a temporary permit pending British governmental approval of the grant, Gridley went to the islands and, after hiring some Canadians and Acadians, began to prosecute the fishery. By 1763 he had 12 families there, with five houses, six vessels, and all necessary equipment for converting the catch into oil. But the “considerable expence” Gridley had incurred went for nought; in late 1763 the Board of Trade refused his petition, apparently because a general policy for the Gulf fisheries had not then been decided upon. Undaunted, Gridley continued to frequent the islands; in 1765 he, four sons, and 22 Canadians and Acadians fished there during the summer. 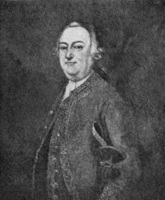 His son Samuel, a Bristol merchant, continued unsuccessfully to petition for a grant of the islands on behalf of his father, and in 1777, after Gridley had joined the American rebels, for himself alone. Gridley was not, however, involved only in the fishery; in 1772 he was operating an iron smelter at Stoughtonham (Sharon) in Massachusetts. With the outbreak of the American revolution in 1775 Gridley offered his services to the rebels, and the Massachusetts Congress commissioned him major-general, colonel of an artillery regiment, and chief engineer of the state’s forces. He supervised the construction of earthworks on Breed’s Hill near Boston and was wounded in the subsequent battle of Bunker Hill on 17 June. The following March he was responsible for the erection of batteries on Dorchester Heights overlooking Boston, the step which is generally considered to have forced the British evacuation of the city on the 17th. In November 1775 Gridley’s “advanced age” had led to his replacement as colonel of artillery, but he remained chief engineer until August 1776 and served as an engineer until January 1781. After his retirement that month he apparently lived at Stoughton until his death. The present-day United States Army Corps of Engineers considers Gridley to be its founding father. Stuart R. J. Sutherland, “GRIDLEY, RICHARD,” in Dictionary of Canadian Biography, vol. 4, University of Toronto/Université Laval, 2003–, accessed April 24, 2019, http://www.biographi.ca/en/bio/gridley_richard_4E.html.